I tried it with tap water and bottled water and I didn't care for it. The taste was something I am not use to with coffee. Where it comes from~ Grade AAA Arabica beans are hand picked from South America and shipped to our Arizona factory. Roasting~ Our advance z-Roasting process reduces the acid and assures a smooth and balance cup of coffee. A word from the founder~ "You'll love how we got rid of the acid, and keep the great flavor. Try a cup and see for yourself. We are certain you'll be back for more. 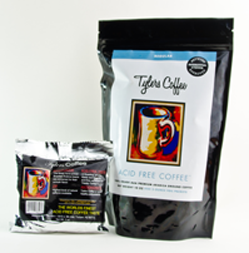 You can purchase Tylers Coffee HERE. Mix 1 coffee pack with 10 cups of water. You can win 5 2oz foil packets by entering below! Their coffee is free of acid! This is what I saw on the website "The Finest hand-picked Arabica beans are shipped from South America to our roasting factory in Arizona. I learned that "Acid levels in coffee, as well as impurities and resins, may wreak havoc on the digestive tract. Our customers with sensitive stomachs are relieved to learn that they can still continue enjoying a great cup of coffee whenever they want." That is awesome because I have a sensitive stomach and often get heartburn after drinking coffee! “If the acid level of the saliva stays below the point for an extended period of time, the outer layers of tooth structure begin to lose minerals and a cavity can from. I learned how he started his company at a very young age...true entreprenurial spirit. If you work hard...your dreams can come true!